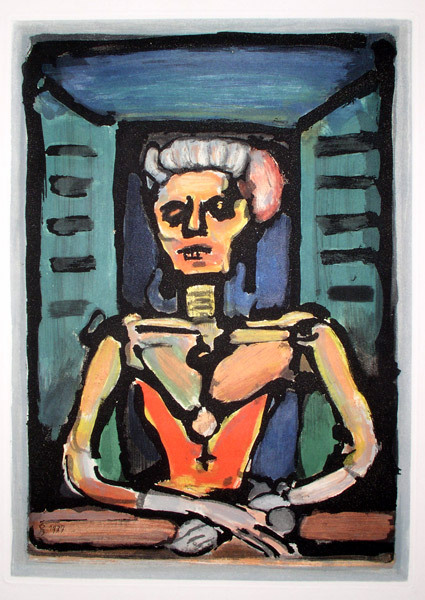 For an introduction to Rouault in general and the Miserere in particular, please click here. Christ among the poor (C&R 258). Original etching and aquatint, 1935. 40 impressions in black & white as ours and 245 impressions in color for The Passion, published by Vollard in 1939. All impressions signed in the plate with the monogram and dated in the plate. There were also 25 impressions HC. The color plates were made by Roger Lacourier from Rouault's hand-painted key plate or from Rouault's gouache under Rouault's supervision. Image size: 306x215mm. Price: $1500. Paysans / Countrymen (C&R 260b). Original color and aquatint, 1936. 40 impressions in black & white and 245 impressions in color for The Passion, published by Vollard in 1939. All impressions signed in the plate with the monogram and dated in the plate. There were also 25 impressions HC. The color plates were made by Roger Lacourier from Rouault's hand-painted key plate or from Rouault's gouache under Rouault's supervision. Signed and dated "GR 1936" in the plate lower right. Image size: 328x232mm. Price: $3750. Christ et la Sainte Femme / Christ and the Holy Woman (C&R 261b). Original color and aquatint, 1935. 40 impressions in black & white and 245 impressions in color for The Passion, published by Vollard in 1939. All impressions signed in the plate with the monogram and dated in the plate. There were also 25 impressions HC. The color plates were made by Roger Lacourier from Rouault's hand-painted key plate or from Rouault's gouache under Rouault's supervision. Signed and dated "GR 1936" in the plate lower left. 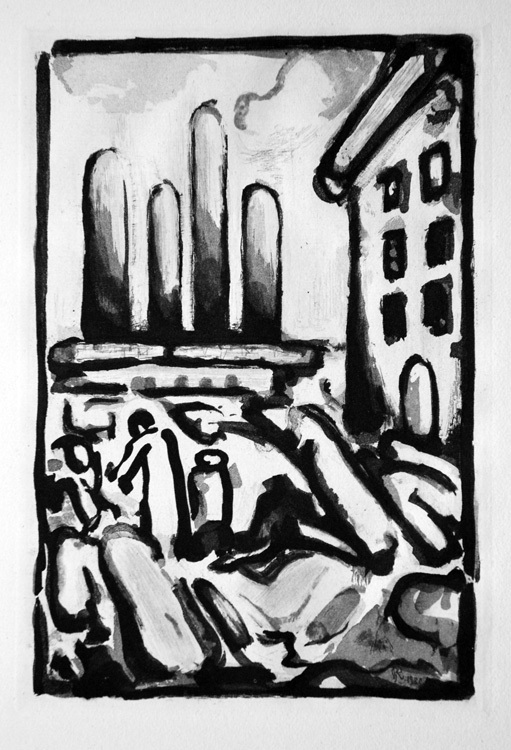 Our impression was included in a major retrospective of Rouault's prints at the Seton Hall University Art Museum during the Autemn of 2008. The Exhibition also included many works borrowed from other museums, including a large group from the Pompidou Museum in Paris. 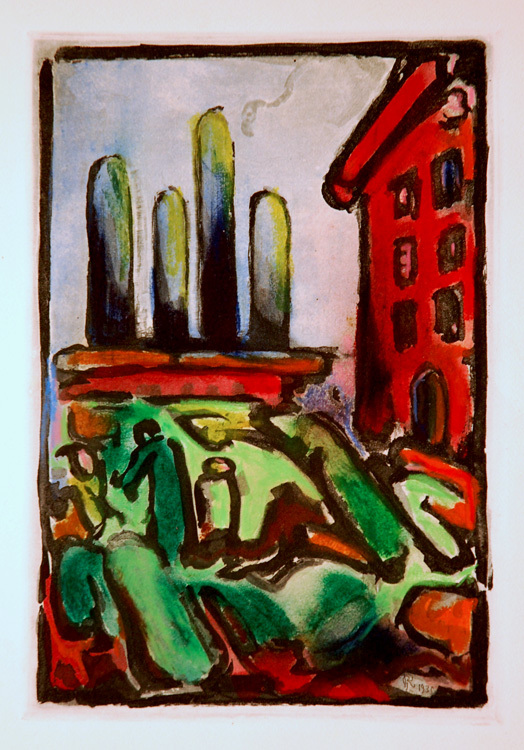 There is a full-page color illustration of this work in François Chapon's Le livre des livres de Rouault (Monte Carlo: Andre Sauret, 1992), p. 167. Image size: 310x208mm. Price: $3750. Christ au faubourg / Christ in the Neighborhood (C&R 262). Original etching and aquatint, 1935. 40 impressions in black & white as ours and 245 impressions in color for The Passion, published by Vollard in 1939. All impressions signed in the plate with the monogram and dated in the plate. There were also 25 impressions HC. 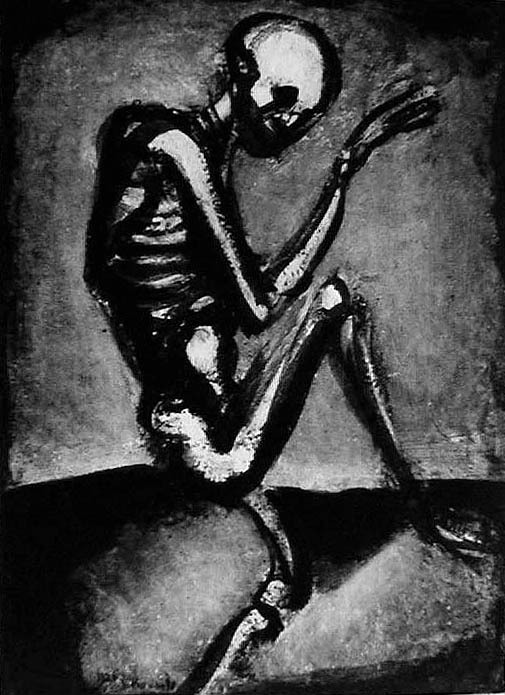 The color plates were made by Roger Lacourier from Rouault's hand-painted key plate or from Rouault's gouache under Rouault's supervision. Image size: 295x195mm. Price: $1500. Christ au faubourg / Christ in the Neighborhood (C&R 262). 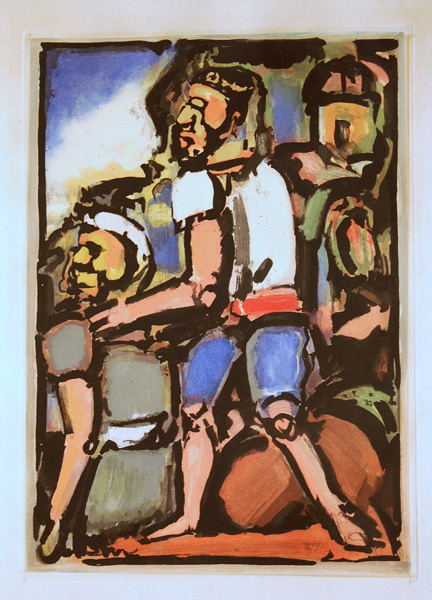 Original aquatint, hand-painted by Rouault with gouache & watercolor, 1935. 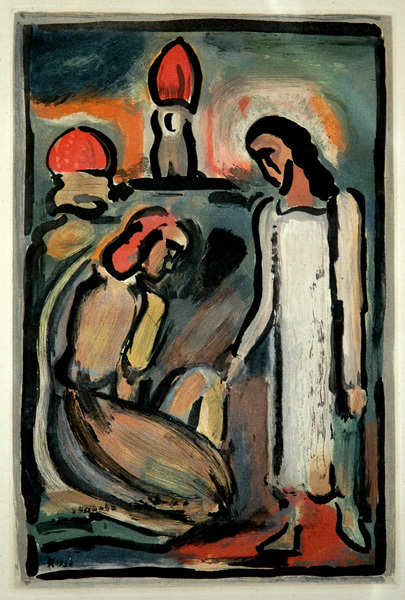 40 impressions in black & white and 245 impressions in color for The Passion, published by Vollard in 1939. All impressions signed in the plate with the monogram and dated in the plate. There were also 25 impressions HC. 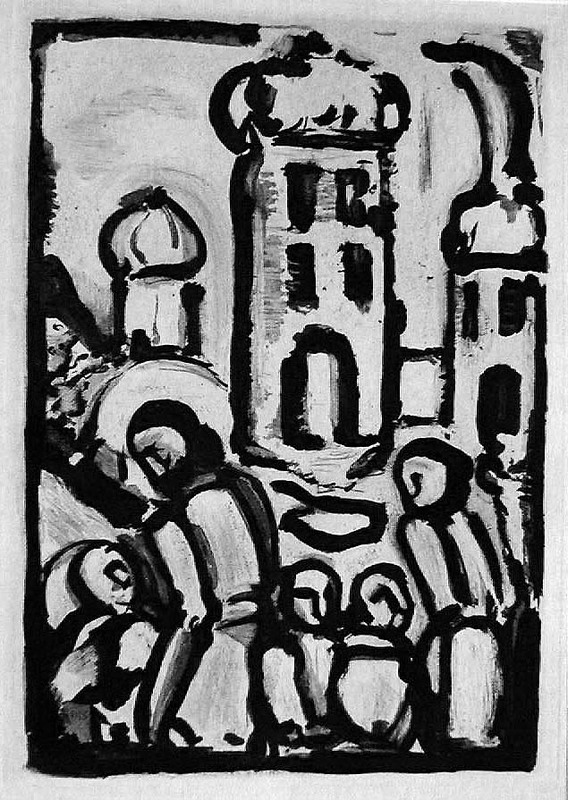 The color plates were made by Roger Lacourier from Rouault's hand-painted key plate (shown above) under Rouault's supervision. Ours is a beautiful hand-painted proof in colors different than those in the final version of the color print. A unique trial proof. Image size: 295x195mm. Price: $25,000. "Fiere autant qu'un vivant, de sa noble stature..." / "As proud as if she were still alive of her noble descent" (C & R 277b). Original color aquatint, 1937. Printed in 1937 for Ambroise Vollard by Robert Lacourière in an edition of 225 unsigned impressions on Montval intended for Vollard's proposed edition, which ultimately fell through due to his death in an automobile accident in 1939. Les Fleurs de Mal 1936-38 (En Couleurs) contained all 12 of the color aquatinits that were completed from 1926-1928. There were also 50 sets of the black plate only. A brilliant impression with rich colors in very good condition except for a very thin stain along the extreme left margin. 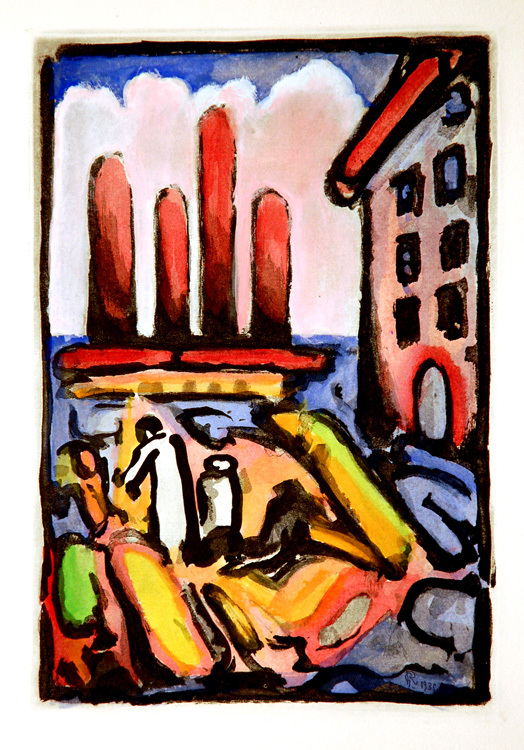 There is a color illustration of this work in François Chapon's Le livre des livres de Rouault (Monte Carlo: Andre Sauret, 1992), p. 134. Image size: 300x214mm. Price: $3750. Squelette (C & R 222). Original aquatint, 1926. Printed in 1927 for Ambroise Vollard by Jacquemin in an edition of 425 impressions intended for Vollard's proposed edition, which ultimately fell through due to his death in an automobile accident in 1939. The prints were not published until 1966 by Fequet et Baudier in Paris. Quatorze Planche Gravées Pour Les Fleurs de Mal contained all 14 of the black and white aquatinits which were completed from 1926-1928. A brilliant impression in very good condition. Illustrated Musée National d'Art Moderne, 1971. Image size: 350x225mm. Price: $2500. Maurice de Vlaminck, James A. McNeill Whistler, and others.